KC Streetcar | KCSA moves to its new home! KCSA moves to its new home! Construction of the Singleton Yard nears completion. The KC Streetcar Authority, KC Streetcar Operations team and members of the KC Streetcar Constructors officially have a new place to call home – The Singleton Yard. Construction of the Singleton Yard Vehicle Maintenance Facility (VMF) at 600 East 3rd Street is 95 percent complete and ready for the arrival of the first KC Streetcar vehicle. It is anticipated that the first streetcar vehicle will make its debut in Kansas City at the end of October. 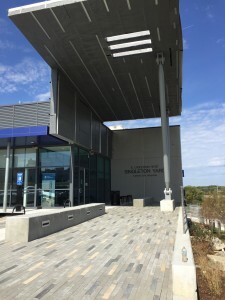 The Singleton Yard VMF, named after architect and long-time transit advocate E. Crichton “Kite” Singleton, is a two-story, full-service operations center that will repair, service and maintain all four of the KC Streetcar vehicles. Located at 3rd Street and Holmes, this site is unique as it allows ground access to both the upper and lower levels because of the slope of the terrain. It is also built to LEED Gold standards with additions such as low-flow faucets, LED lighting, solar tube lighting in the maintenance bays and pervious pavement throughout the facility. “The Singleton Yard is, in part, a visual representation of the hard work, determination, and leadership put in by many individuals throughout the years, “said Tom Gerend, executive director, KC Streetcar Authority. “My gratitude and extreme appreciation goes out to all involved, moving the KC Streetcar project from vision to reality. This is truly a proud moment,” continued Gerend. The Singleton Yard is a total of 24,982 square feet and includes 10,966 square feet of work area, 7,635 square feet of equipment and storage area, and 6,381 square feet of office area. Construction started in July 2014. For more information, visit the KC Streetcar website at www.kcstreetcar.org or contact Donna Mandelbaum, Communications Manager with the KC Streetcar Authority at 816.627.2526/816.877.3219 or email at dmandelbaum@kcstreetcar.org. The KC Streetcar is also online on Twitter (@kcstreetcar), Facebook (@kcstreetcar) and Instagram. For a print out of the release, click here: KC Streetcar Authority Moves to its new home.